"HERE I AM", I SAID, "SEND ME"
Our readings this Sunday remind us that God does not call us to mission because we are worthy or capable or talented. In fact, we are not. He calls us to cooperate with his Grace, because he love us and wants us to be like him. Today, we hear the call of both Isaiah and Simon (Peter). How similar they are. In our first reading (Isaiah 6:1-8), we hear Isaiah's description of his call by God in highly descriptive language. Isaiah's initial response to God was typical of the reluctant servant - I am not worthy, I am sinful, get someone else. Yet, God, in his Grace, did not regard his sinfulness; he sent him on a mission to speak God's word. Isaiah's response was yes, "send me." In the year King Uzziah died, I saw the Lord seated on a high and lofty throne, with the train of his garment filling the temple. Seraphim were stationed above. They cried one to the other, "Holy, holy, holy is the LORD of hosts! All the earth is filled with his glory!" At the sound of that cry, the frame of the door shook and the house was filled with smoke. Then I said, "Woe is me, I am doomed! For I am a man of unclean lips, living among a people of unclean lips; yet my eyes have seen the King, the LORD of hosts!" Then one of the seraphim flew to me, holding an ember that he had taken with tongs from the altar. He touched my mouth with it, and said, "See, now that this has touched your lips, your wickedness is removed, your sin purged." Then I heard the voice of the Lord saying, "Whom shall I send? Who will go for us?" "Here I am," I said; "send me!" In our Gospel reading (Luke 5:1-11), we hear about the call of Simon (Peter) by Jesus, with the miraculous catching of fish. Simon's response was similar to Isaiah's - "Depart from me Lord, for I am a sinful man.". Jesus did not see his sinfulness. He saw a loving leader of his disciples and of his Church. "Don't be afraid, from now on you will be catching men." Simon's acceptance was similar also to Isaiah's, "They left everything and followed him." While the crowd was pressing in on Jesus and listening to the word of God, he was standing by the Lake of Gennesaret. 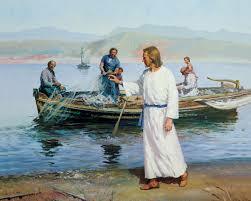 He saw two boats there alongside the lake; the fishermen had disembarked and were washing their nets. Getting into one of the boats, the one belonging to Simon, he asked him to put out a short distance from the shore. Then he sat down and taught the crowds from the boat. After he had finished speaking, he said to Simon, "Put out into deep water and lower your nets for a catch." Simon said in reply, "Master, we have worked hard all night and have caught nothing, but at your command I will lower the nets." When they had done this, they caught a great number of fish and their nets were tearing. They signaled to their partners in the other boat to come to help them. They came and filled both boats so that the boats were in danger of sinking. When Simon Peter saw this, he fell at the knees of Jesus and said, "Depart from me, Lord, for I am a sinful man." For astonishment at the catch of fish they had made seized him and all those with him, and likewise James and John, the sons of Zebedee, who were partners of Simon. Jesus said to Simon, "Do not be afraid; from now on you will be catching men." When they brought their boats to the shore, they left everything and followed him. In our Epistle reading (1 Corinthians 15:1-11), we don't hear about Paul's call, but we hear about the results of his acceptance. Like Isaiah and Simon, Paul saw himself as unworthy ("the least of the apostles"), and yet he accepted Jesus' call to preach the three cornerstone truths of our faith - Jesus died for our sins, was buried and rose again. And with God's grace, he was "not ineffective." I am reminding you, brothers and sisters, of the gospel I preached to you, which you indeed received and in which you also stand. Through it you are also being saved, if you hold fast to the word I preached to you, unless you believed in vain. For I handed on to you as of first importance what I also received: that Christ died for our sins in accordance with the Scriptures; that he was buried; that he was raised on the third day in accordance with the Scriptures; that he appeared to Cephas, then to the Twelve. After that, Christ appeared to more than five hundred brothers at once, most of whom are still living, though some have fallen asleep. After that he appeared to James, then to all the apostles. Last of all, as to one born abnormally, he appeared to me. For I am the least of the apostles, not fit to be called an apostle, because I persecuted the church of God. But by the grace of God I am what I am, and his grace to me has not been ineffective. Indeed, I have toiled harder than all of them; not I, however, but the grace of God that is with me. Therefore, whether it be I or they, so we preach and so you believed. How does all this apply to me, you might ask? We, in our own way, are all Isaiah; we are all Simon; we are all Paul. We are all unworthy, sinful people. We are all called by God to bring to life some charism (gift of the Spirit). With God's grace (not our own), we will accomplish God's will.